New Delhi: The government has said in the Lok Sabha there is no proposal to curb the import of e-cigarettes, a statement seen as a U-turn from its decision to ban the use of these devices across the country. An e-cigarette is a handheld electronic device which works by heating a liquid to generate an aerosol, commonly called “vapour”, that the user inhales. The liquid used is generally made of nicotine, propylene, glycerine and some artificial flavours. It simulates the feeling of tobacco smoking and is also known as the vaping device. During a roundtable in July 2014, the Centre had indicated that it would consider a ban on e-cigarettes, also called electronic nicotine delivery system. However, minister of state for commerce and industry C.R Chaudhary said in the Lok Sabha Monday that at this stage, there is no proposal to ban the import of e-cigarettes. Chaudhary, however, announced that “the available scientific evidence indicates that e-cigarettes are hazardous for an active as well as passive user and it has a serious impact on public health”. The import of e-cigarettes has zoomed in India over the past two years. According to the data shared by the minister in the Lok Sabha, India has imported 19,585 units of e-cigarettes in the last fiscal year against 9,761units in 2016-17, registering an increase of over 100 per cent. In 2016-17, India was importing these devices mainly from China followed by the US, Germany and Hong Kong. However, last fiscal, the imports from China doubled to 19,543 units from 9,380 units. 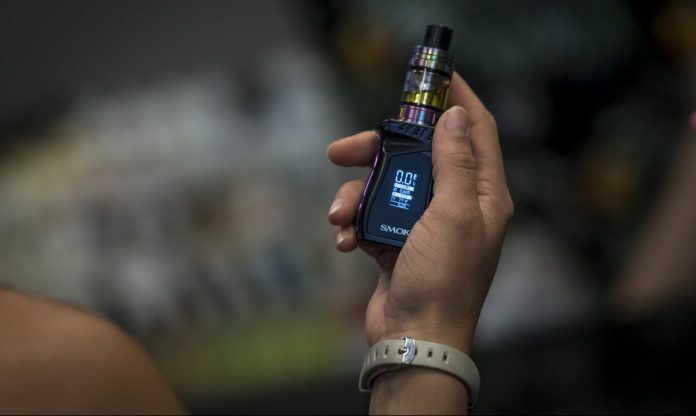 According to experts, the spike in sales of unregulated e-cigarettes could be dangerous for the country where the number of smokers is on the decline. While the government was cheering the fall in the percentage of tobacco users by six per cent — to 29 per cent in 2016-17 from 35 per cent in 2009-10 — it could probably mean that e-cigarettes are becoming an option for smokers by inducing nicotine addiction. According to Dr Animesh Arya, senior consultant, respiratory medicine at Sri Balaji Action Medical Institute, smoking e-cigarettes “looks like a cooler option” and more youngsters may fall to this habit. “More dangerously, it could also encourage citizens to become users of tobacco as well as nicotine. Regulation is a must on these devices,” Arya said. The minister in the Lok Sabha also quoted a World Health Organization report saying that 25 countries have legislations banning the sale of electronic nicotine delivery system (ENDS) and electronic non-nicotine delivery system. While the Centre hasn’t announced a blanket ban on e-cigarettes, states including Bihar, Punjab, Maharashtra, Kerala, Karnataka, Mizoram, Jammu & Kashmir and Uttar Pradesh have prohibited their use amid rising health concerns. Globally, vapour technology has become a billion-dollar industry already. The Washington-based Vaping Technology Association represents more than 600 manufacturers, wholesalers, distributors and retail shops from across the globe. Tobacco giants such as Reynolds American and Philip Morris have also entered the market.